I have this obsession with the back of things. Sometimes I like the inside better than the outside. 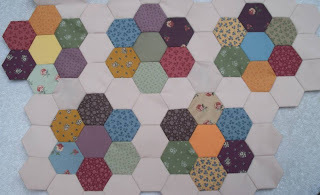 My English paper piecing quilt is coming along nicely and I like the outside but I LOVE the inside. There is a spontaneous energy there that is missing on the neat little contrived front. See what I mean? Or am I thinking too much like someone with an art degree? It's just going to be something to keep my lap warm for Pete's sake. It took me another entire precious weekend day, but I finally conquered the loom. Using lots of leftover skeins of cheap acrylic and the remaining skein of Lion Brand Harvest Homespun that I got on clearance at Walmart last week, I came up with a plaidish pattern that will keep me busy for a few minutes each morning before I dash out the door for work. 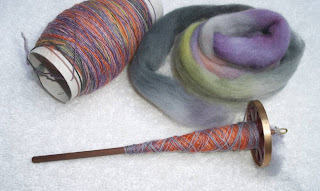 I weave in the morning, knit all day and spin at night. 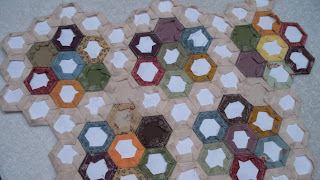 Somehow I have to figure out where I am going to fit in some quilting because I have a billion little hexagons all over the coffee table. I have spent the ENTIRE day watching the Kennedy funeral services and completely destroying 4 skeins of yarn. 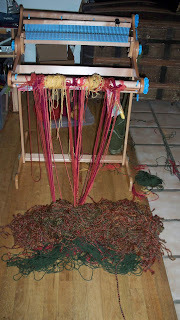 Warping is a nightmare if you don't plan ahead AND if you don't pay complete attention to what you are doing. 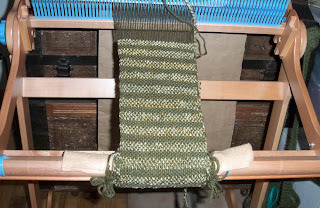 I suppose there is a weaving version of swatching and if I had thought about it, I could have saved a perfectly good skein of Lion Brand Harvest Homespun because I would have known better than to try to use such a springy yarn as the warp. What a mess. 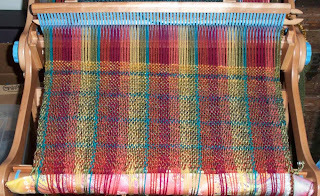 Next I tried to take it out and replace it with some sport weight but could never match the tension with the other warp yarns I wanted to leave in place. Grrrrrr. To heck with it all. Throw it all away. Try again tomorrow. Fiddly dee. I am going to go spin something instead. 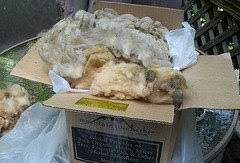 I bought the giant box of raw Gulf Coast Fleece so that I would have plenty of cheap wool to torture over the long, cold winter. 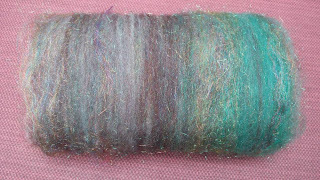 This first attempt at scouring, carding a batt and then dyeing it ended up a big disappointment. 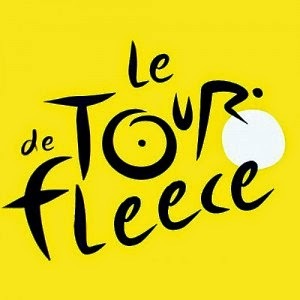 This fleece does not seem to like to take color. 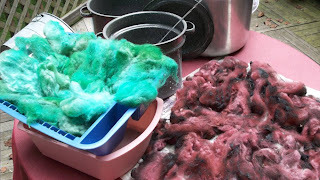 The paper towels underneath were brilliant but even after 2 dye sessions the wool still looked rather washed out. 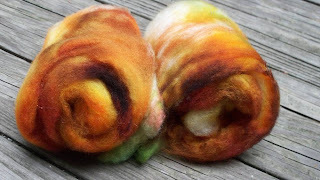 I had such great results with the same dye on the Corriedale so I am not sure what went wrong. Although not entirely happy with the dye job, I went ahead and spindled up a bunch, plied it and them started on a plain old sock to see how it would look. Not so terrible. Not what I intended but for just another itchy old sock-it'll do. While waiting for this box of cotton to show up I found it strangely difficult to look at my empty loom. Although I swore my scarf days were over, I decided to make a quick scarf out of the leftover yarn from my CPH with some Lion Brand Homespun that was leftover from daughter's prayer shawl. Nothing fancy just simple mindless weaving of the potholder variety. Chunky yarns on the loom are fast and fun so now that I ordered all that skinnyish cotton I may just put it on hold for a while in order to make a fat, chunky throw using the giant tub of crazy colored cheap acrylic I accumulated in my mad scarf days. 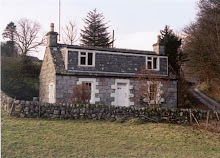 If you follow me on Twitter or read my daughter's blog, you may know that she is moving in a few weeks to an itsy bitsy apartment in New York City. No room for anything but the bare necessities . Since I have spent many an hour in vain trying to ignite the knitting bug in her, as a punishment I get custody of all the yarn and half knitted projects that she has no room for. 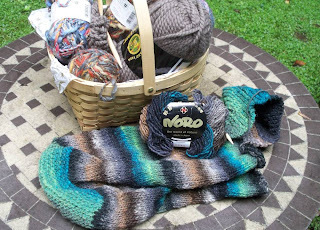 That Noro bag that she designed is gorgeous and is definitely going to the top of my to do list. 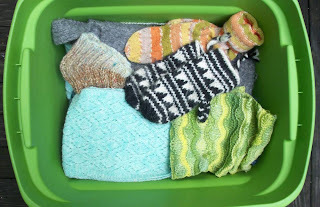 I also am getting custody of all the handknit thing-a-ma-bobbies that I have made for her over the years. She used to be a figure skating coach and spent long hours in cold rinks so she was a sitting duck for every hat, scarf, sock or mitten that I wanted to knit but did not want to wear. There is some pretty awful stuff in this bin but I promise to take good care of it until the day she asks for it back. 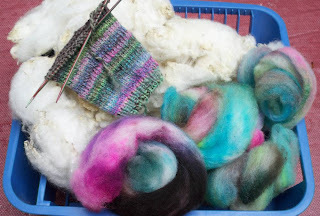 I have spun a lot of wool in the past few years, but never enough to do anything big with. I spent the whole summer dedicated to one giant mound of roving that I am very happy to say will one day be a sweatery shrug type thing. I know that I have 600 yards of this beautifully colored but horribly itchy handspun thanks to my new little yarn meter gadget. 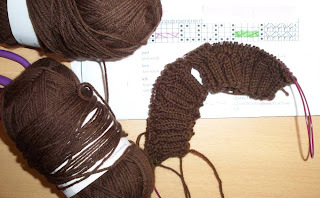 I am knitting a seamless pattern from the top down so I can see just how much I am using because I want to squeeze out as much length in the body as I can. Sleeves, I am not worried about. I want a loose short sleeved cardi to pull overtop of something thick so the itch can't get me. Just in case you haven't noticed, I have not one but two tickers counting off the days to the 2010 MD S&W Festival. May can't get here soon enough. Each year I make something new to wear or carry. This year I already have my two Montavilla Market Bags I made to hold the ginormous amount of stash I intend to buy. 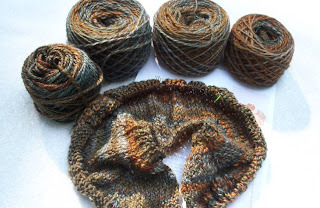 Part of last year's stash is being turned into this year's shawl (I hope). I began spindling this Party in a Bag of merino on the way home last May with the tiny .45 oz Golding Sweetheart spindle I had just bought. 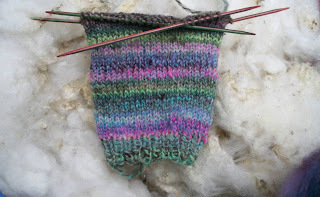 I am gambling that I am going to get enough for a Swallowtail by February when the knitting should begin. Ambitious. You bet. Impossible. Maybe. 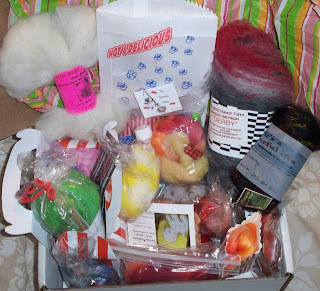 I swore up and down I would NOT try to snag the August Phat Fiber Sample Box but look what showed up today in the mailbox. Although my lack of willpower made me very ashamed at the time, I am very happy today that I gave in. Look at all the spectacular goodies. Lots and lots of little bags of fuzzy stuff in lots of pretty colors. The days of dyeing with Kool Aid and Food Coloring are OVER. 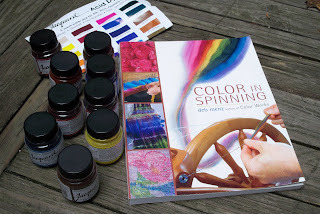 I finally broke down and bought some real dye and a book that tells you how to use them. This batt, while pretty is a little on the bland side. It was dyed with Kool Aid. Pow! These colors pop right out and hit you in the eye. 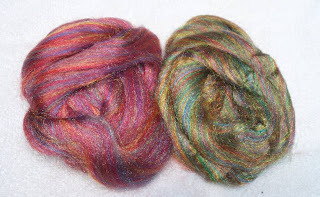 These are my new Jacquard colors used on two mini Corridale batts I carded from a 4 oz unwashed sample I bought from Natchwoolie. Deb Menz's book was an enormous help and inspiration. Thank you Rexenne for recommending it in your fantastic You Tube tutorials. If you are reading this on the day it was posted I want you to feel sad for me because my wonderful vacation/staycation is over and I went back to work this morning. 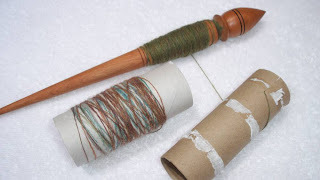 If I were home today I would be using my little spindle friend here on some of the bits of fiber that I clean off the drum carder after I use it. I've been hand carding it then turning into mini rolags and now I have got a real Frankenstein yarn happening that I can't wait to ply. I always have more fun with the leftovers than I do with the real stuff. Less pressure. I can use less pressure. Especially today. Note to Self: Get over it. There are always weekends, you big crybaby. The Red Wrap is Done! I am sad to say that my slaving over the loom all summer was pretty much for naught. It is too small. It is itchy. It is horribly wonky. The only good thing I can say about this project is that it is done. I need to step away from the loom for a while and get a grip. My ability is not in the same place as my ambition and that is the sure path to disappointment. Back to little things, chunky things, things that I understand. Maybe next summer I will be ready for another try at something so ridiculously ambitious. 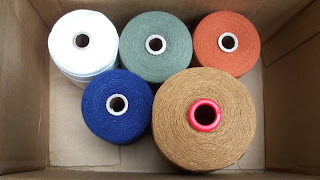 I do have a cone of teal soy silk that is gorgeous. But it has to wait until I figure out how to control the tension better so that I don't end up with another brightly colored fishing net. The Winter Olympics in Vancouver are just months away and I can't be more excited. 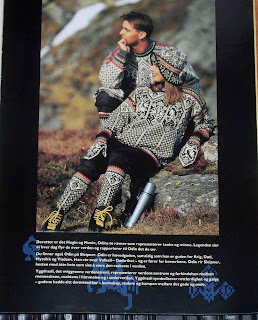 Winter is my season and I plan on fueling my anticipation by knitting the official 1994 Dale of Norway Olympic sweater that was created for the Norwegian National Ski Team. 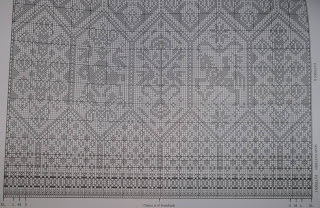 That is the year that the winter games took place in Norway and they went all out with this amazingly beautiful (difficult) pattern. I first bought the booklet way back in 1994 but was so intimidated I only attempted a short version of the matching socks. This will probably take me until the next Winter Olympics to complete but it will be worth waiting for. It's gorgeous. 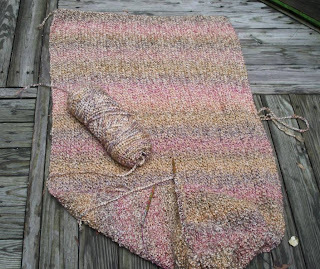 I am using Knit Pick's Palette in Asphalt Heather and Cream as the main colors along with Garnet, Golden and Tidepool Heather for the edging. So far I have managed to swatch a bit and then cast on all 244 stitches that will soon increase by 34 in order to work chart one of the pattern. I just hope I don't go blind before this sweater is done. I really would like to see the games. 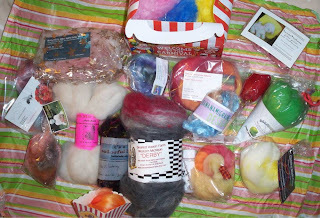 I received my "secret" email from Phat Fiber this week and this month's box drop is in the very near future. I don't need another box. Really, I don't. I have not even spindled my way through the first one I managed to get, not to mention the second one that is filled with all that crazy gorgeous silky stuff. Nonetheless, I have an extremely itchy finger that just wants to play that insane game once again. 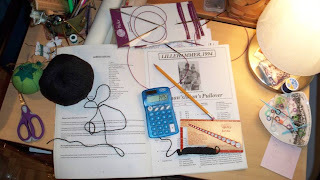 It's gambling for knitters and it is an extremely overwhelming urge that is impossible to ignore. I can hear the clock tick every second until that magic time. I get an adrenaline rush just thinking about it. It is addictive. But I am stronger. I just have to be. ....along comes a project like this. 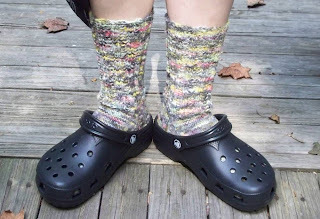 These are a pair of Thermal Socks from the KP design team and they are very close to ending up in the frog pond. The original pattern is toe up but I hate toe up so I have changed them around and am going cuff down. But that is not the problem. 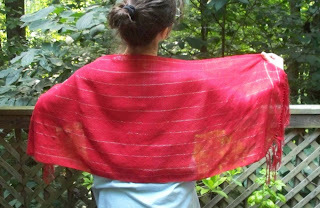 It is the blankety blank thermal stitch that has you purling in the back of 2 stitches backwards. That means putting in the needle from the left. From behind. It's hard. I don't know if I want to knit something hard. I can do lace. I can do Fair Ilse. I can do garter stitch with my eyes closed, but this is really hard. 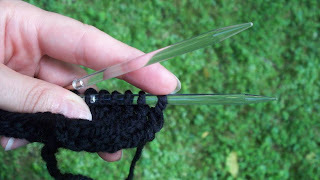 All that twisting of the needle and struggling to keep both stitches on when you can't see what you are doing. I have a dilemma. Tough it out or give it up? I almost forgot all about the sparkly Firestar that I had ordered from Fuzzy Wuzzy Fibers. I bought it in the Red and Tropical colorways. 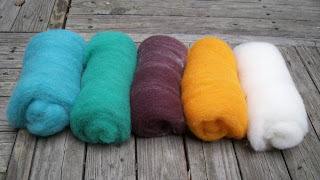 These are blends of several metallic colors and are in roving form. Both the Firestar and the Angelina that I posted about earlier are man made fibers that feel a bit plastic to the touch so they tend to be a bit scratchy on the skin. 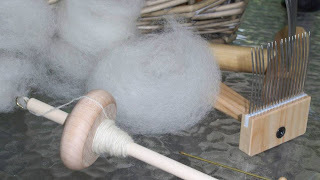 The cute little wool batts I have been carding all summer feel like barbed wire on the neck so adding a little more itch should not be a problem. I can do itchy-as long as its on the feet. But glitter socks? I dunno. 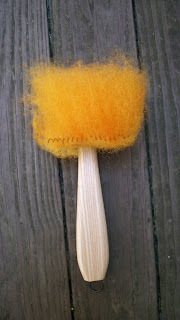 As I was combing out my multicolored wool I kept thinking that I have seen this before. 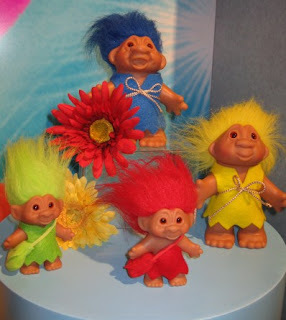 Thank you about.com for the adorable picture of those cute little trolls. I want one. I sure won't be doing this. I'll be sitting in meetings and trying to figure out how many days I have until my next vacation . I had precious few days all to myself this summer but I did my best to make use of every possible minute. 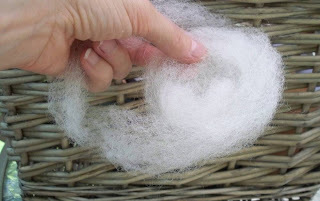 My fondest memory will be of the quiet mornings I spent pretending I knew what to do with a very raw fleece. Ignorant I may be, but I did manage to crank out several of these cute little babies. And I learned the hard way that orange Kool Aid is really fierce! Use with caution. It's been that long? My how time flies. And thanks a lot for ruining my post by stealing my funny photo and posting it a week earlier. Just wait until next year. I'll get even! It just seems like yesterday that I squeezed you into those mint green overalls I knitted for you and ran you off to Olan Mills for a portrait while you were still clean. This is a rare smilin' Zak photo. You were always intense but never more so than when you were a baby. My poor Little Sister had one of those weeks last week that can turn your hair snow white. At our ages, doctor visits are the stuff nightmares are made of. A simple blood test can lead to a death sentence in the blink of an eye. Whew. If there is one thing that I have learned this summer it is that you can't take anything or anyone for granted. 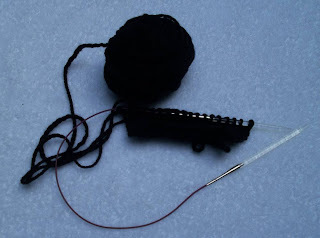 My response to stress is always to pick up the needles so, Auntie S, here is the way I am dealing with all this worry. This is your almost finished Prayer Shawl (just in case of....well, you know...whatever). 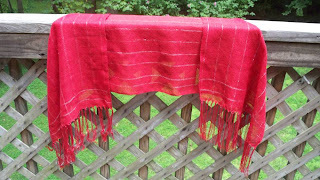 Now Prayer Shawls may be ugly but they are adult security blankets-trust me, I know. I also know you want a shawl with pockets for reading and I am working on it but in the meantime this one will have to do. Just don't hold your breath. I have been trying to knit with my fingers crossed so it's been rather slow going. The New Zephyrs Have Arrived! Knit Picks new Zephyr needles are fun! I sat down to play with them for a few minutes and did not want to put them down. They are so light and sparkly. It is like knitting with a beam of light-perfect for dark yarns. I bought a few of the smaller sized tips to play with and after a try I just had to go back for a few of the larger tips as well. I still love my Harmony needles but when I want to fly I am going to use the Zephyrs. This is the end of that box of dirty mystery fleece I bought in the early spring. I am guessing that the part I picked out today would have ended up in most people' s trash pile but I was just not ready to say goodbye quite yet. I've got this production down to a science now and can't wait until I can get my hands on another fine fleece to torture. The Mister was very taken back by the orange. He kept asking me what I planned on doing with it. I suspect he was fearful it may end up as something for him. Not to worry. All these colors will be blended into little striped batts to end up as who-knows-what who-knows-when. No one in the family needs to worry. As summer makes its exit I am starting to set aside supplies for the winter. 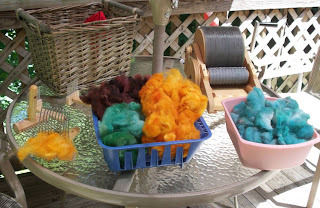 Not imagining I want to spend hours on the deck combing and carding dirty wool in the cold of winter, I am washing and dyeing the remainder of that box of filthy fleece I have left from my Tour de Fleece adventure. The fiber people at Etsy certainly have nothing to fear from me. 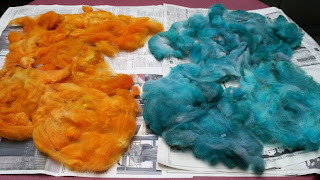 I won't be quitting my day job to start a dyeing operation. I have no eye for color whatsoever. I gave up trying to make the colors I wanted and just took what a got in order to stop wasting my dye. Next Easter I am hoarding those tablets. The only time I ever get colors I like are from leftover egg dye. Can You Stand Just One More? I know I have been going on and on lately about the Phat Fiber Sampler Boxes but they really just go on forever in terms of providing endless amusement. 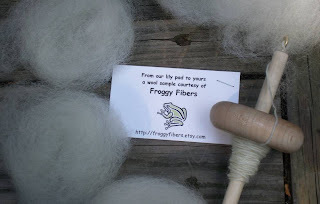 Froggy Fibers contributed a small sample of unwashed Cheviot to my June Fluff Box that I just had too much fun washing. In contrast to my giant box of yucky poo fleece, the sample was in very nice condition. 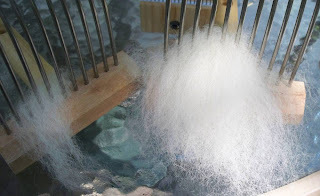 It only took a light washing to end up with this sparkling white fiber that was a joy to comb. I had bought this diz a while ago not really knowing what to do with it. With the help of some You Tube tutorials I managed to get a bit going through. 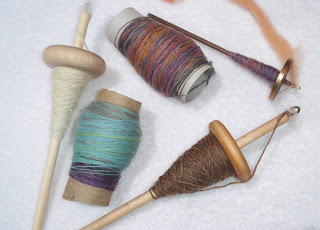 I turned it into little ribbons that spun up very nicely on a spindle. It would have spun up very fine, but I need it to match the other samples for the chunky hat I am making out of the June Box. I am only about 1/100th of the way through and the July box is already here. Where does the time go? Don't worry about me beating you out of an August box. I AM sitting out the next few months or I will go crazy from all this joy. I know that this is NOT a drop spindle but rather a support spindle but I just couldn't resist this post title. 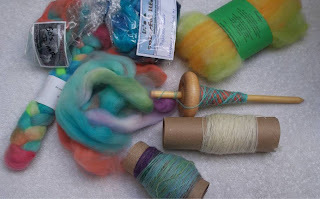 I am happy to say that I am making decent progress with the Russian spindle by spinning up random bits and bobs of whatever I fiber I have leftovers of. I am finding that slippery fibers work best for me at the moment as there is no such thing as fiddling with your drafting zone. It is either there or it is not. 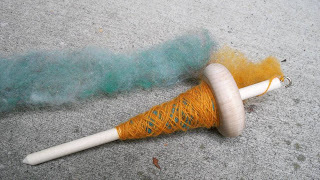 I have been trying to learn to spin from the fold so I don't have to wrestle a length of roving while so much else is going on but it is apparently harder than it looks. 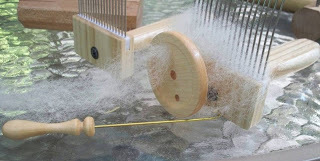 All this sounds a bit scary but the actual spindling is very relaxing. I like it better than drop spindling which always makes me nervous. I am not making frog's hair yet, but these are the finest and strongest singles that I have ever made. Having said that I am not giving my little darlings up. I will just use them when I am up for a challenge.